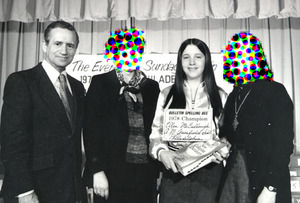 The surging popularity of all things related to spelling bees has forced me to revisit a painful episode in my past, when I came in a shameful 16th place in the Philadelphia city-wide spelling bee of 1978. The annual Bee was sponsored by the Philadelphia Evening Bulletin, which proudly carried the tagline, "Nearly Everyone Reads the Bulletin." But not everyone read the Bulletin, as the newspaper went out of business four years later, leaving nearly everyone to read the Philadelphia Inquirer. This may have been due in part to the fact that they blew a lot of money sponsoring spelling bees for pimple-addled junior high schoolers. So I was thinking about all of the bee-craziness in our culture today: books and movies such as Akeelah and the Bee, Spellbound, Bee Season, The Secret Life of Bees... oh wait; that one wasn't about spelling bees. And I remembered that I was all about the Bee before anyone ever thought to make a movie or write a book about it. Some faces have been obscured to protect the innocent. The man on the left, however was the moderator who tripped me up with the word "planxty," so he gets to have his picture posted on my blog. It was a big day. I washed my hair three times, with Herbal Essence Shampoo (or was it Faberge Organic? Or Earth Born?) and put on Maybelline mascara. I wore a skirt, for God's sake. I wore my fabulous, reversible blue/silver baseball jacket. And since this was a special occasion, I wore it silver side out. And I went on to shame my school, by mispelling planxty [\Planx"ty\, n. [Cf. L. plangere to mourn aloud.] (Mus.) An Irish or Welsh melody for the harp, sometimes of a mournful character.] I have not had occasion to use the word planxty in the 28 years since. All I got to show for my humiliation that day was a copy of Merriam-Webster's Collegiate® Dictionary, a silly enamel pin with a bee on it, and this photo. I still have all three, although I don't know exactly where that enamel pin is.